A cafe that has outlets in Leh-Ladakh, Varanasi and now in Delhi too, OpenHand offers fluffy muffins, hearty breakfasts and a good, peaceful time away from Paharganj’s chaotic crowd. It’s also a venture that’s all for ethical living. How? We’ll tell you in a bit. In the narrow lane towards Chabad House (pronounced Habaad), right opposite to it actually, is the corridor-like OpenHand Cafe & Gallery. 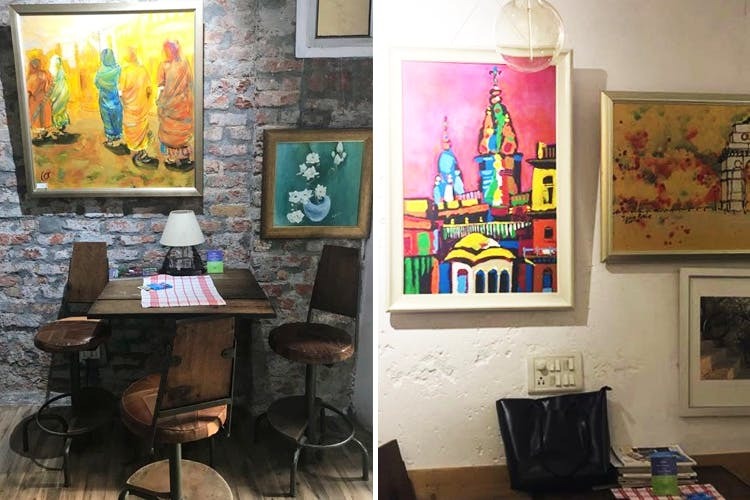 This cosy cafe with its brick walls, leather bar stools and stunning paintings, is Paharganj’s own little hipster paradise. Just saying… It’s got a pretty picture corner too. While OH is mainly a cafe, it is also a gallery with paintings that are actually on sale. If, like us, you’re too broke to buy a painting (which can go up to a few thousands, easily), you can always rejoice in the fact that the food here’s priced affordably. We ordered the all-day breakfast that came with fluffy scrambled eggs, roast tomatoes, two slices of multi-grain bread with blueberry jam, butter and a fresh Pineapple and Apple smoothie (you can opt for Banana Papaya or their Breakfast Smoothie too). All this came at the low, low price of just INR 160 (broke, breakfast-loving folks, we’re looking at you!). Just when we thought we were done, OpenHand’s lovely bakery counter called out to us with its home-baked Strawberry, Blueberry, Banana and Carrot and Walnut Muffin. We got ourselves the fluffiest of Blueberry Muffins that were just the right amount of sweet but left us wanting more of the blueberry compote. Not a brekkie fan? They’ve got pastas, pizzas, a hummus platter, waffles, shakes and a lot more to keep just about everyone happy. Remember we said that they’re all about ethical living? Well, the folks at OpenHand focus on creating employment opportunities for the underprivileged, offer skill-training workshops to them and they’ve even got a tiny section in all their cafes selling bags, PJs (we love the avocado one!) and toys, all made by them. Places that do good, serve all-day breakfasts and pizzas made from scratch (oh hello, Basil & Mozarella Cheese Pizza) are already a winner in our books. But since OH’s far, far away from the main road and really lets you enjoy both your coffee and company in peace, we’ve grown quite fond of it. We’ve even considered being a snob and not writing about the cafe, because we like that it’s not overflowing with people. While we’re secretly hoping that things don’t change, we do wish that they open more outlets around town.